Although the article states that measureable snow falls about once every 20 years, the above stats tell me that it must be more frequent, possibly as often as once every 8 or 9 years. Below in Figure 1 is a special weather statement issued by the local Las Vegas NWS office. It speaks for itself. PARTICULARLY ACROSS THE WESTERN PORTIONS OF THE VALLEY WHERE TOTAL ACCUMULATIONS OF UP TO 10 INCHES ARE FORECAST. THE SNOW BEGAN TO FALL ACROSS MUCH OF THE LAS VEGAS VALLEY EARLY WEDNESDAY AFTERNOON AND WILL CONTINUE THROUGHOUT THE OVERNIGHT HOURS. THIS WILL LIKELY BE THE BIGGEST SNOWSTORM TO IMPACT LAS VEGAS SINCE 1979...WHEN 7.8 INCHES OF SNOW WAS MEASURED AT MCCARRAN INTERNATIONAL AIRPORT. SNOW REMOVAL EQUIPMENT IS EXTREMELY LIMITED IN THE LAS VEGAS VALLEY AND THE EFFECTS FROM THIS STORM WILL LIKELY LINGER INTO THURSDAY. TEMPERATURES QUICKLY REBOUND IN MANY INSTANCES FOLLOWING SNOW IN THE LOWER DESERTS. THIS WILL NOT BE THE CASE ON THURSDAY...AS THE TEMPERATURE WILL NOT CLIMB OUT OF THE 30S. Figure 1. Special weather statement issued by the local Las Vegas weather office at 2PM on 2008-12-17. Courtesy NWS Las Vegas. Figure 2. A Las Vegas woman walks through a surprisingly holiday-looking atmosphere for Las Vegas. Courtesy Mona Shield Payne / Special to the Home News. As occurred in the New Orleans event, Figure 2 below shows a very deep 500mb trough with a developing cutoff low moving over the area as a strengthening surface low moves just ahead of it. The 300mb chart in Figure 3 shows a powerful jet streak with 130 knot winds providing considerable lift over the area. As this streak moves through and lifts northward tonight, the right entrance of this streak could enhance further development of the low should it position over the area properly. Although temperatures were slightly above freezing when the snowfall started this afternoon, in Figures 4 and 5 we can see that they are now (6:30PM local time) below-freezing over the city and surrounding areas, with dewpoints also below freezing, guaranteeing them an all night snow event. Finally, the radar and satellite images in Figures 6 and 7 support the other evidence that an unusually strong flow of Pacific ocean moisture is being pulled into the desert southwest and southern Nevada. The critical factors are how strong the low gets under that 300mb jet streak, and how much of that dry air in the dry slot of the low (Figure 7) works into the Las Vegas area. Stay tuned. Figure 2. GFS 500mb conditions 2008-12-17 18Z. Courtesy NCEP. Figure 3. GFS 300mb conditions 2008-12-17 18Z. Courtesy NCEP. Figure 4. Surface conditions at 00Z on 2008-12-17. Courtesy HPC. Figure 5. Close-up of southwest surface conditions at 00Z on 2008-12-17. Courtesy HPC. Figure 6. Radar reflectivity at 2008-12-17 03Z. Courtesy RAP/UCAR Figure 7. 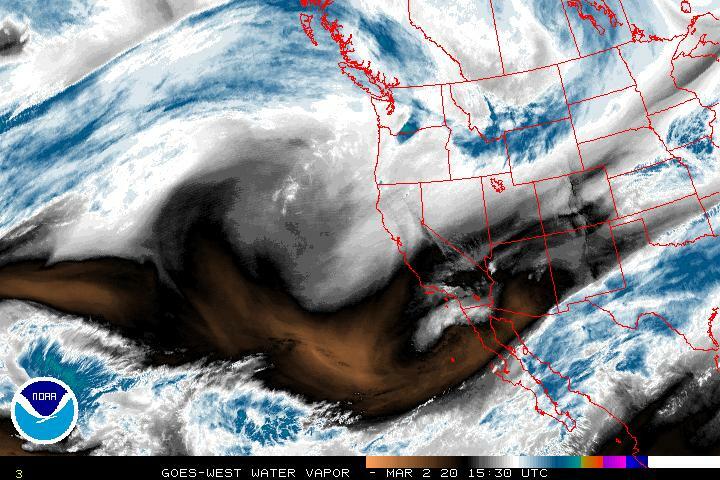 Water Vapor satellite at 0230Z on 2008-12-17. Courtesy NOAA SSD. POST MORTEM: Figure 8 below is the definitive weather statement from the local weather office after they broke the record. AN ALL-TIME RECORD SNOW FOR THE MONTH OF DECEMBER IN LAS VEGAS WAS SET YESTERDAY DECEMBER 17TH 2008. 3.6 INCHES OF SNOW WAS MEASURED AT THE NATIONAL WEATHER SERVICE OFFICE LOCATED ABOUT 2 MILES SOUTHWEST OF MCCARRAN INTERNATIONAL AIRPORT. THIS BROKE THE RECORD FOR THE MOST SNOW EVER IN THE MONTH OF DECEMBER IN LAS VEGAS SINCE THE START OF OFFICIAL RECORDS IN 1937 WHICH WAS 2.0 INCHES ON DECEMBER 15TH 1967. THIS IS NOW THE 8TH GREATEST SNOWSTORM EVER IN OFFICIAL LAS VEGAS WEATHER RECORDS FOR ANY MONTH. THE 3.6 INCHES OF SNOW MEASURED YESTERDAY ALSO SET A NEW DAILY RECORD FOR SNOW FOR DECEMBER 17TH BREAKING THE OLD RECORD OF A TRACE SET IN 1992. MEASURABLE SNOW HAS ONLY FALLEN ON 5 INSTANCES SINCE 1937 IN THE MONTH OF DECEMBER IN LAS VEGAS COUNTING YESTERDAY...2.0 INCHES OF SNOW WAS MEASURED ON DECEMBER 15TH 1967...0.4 INCHES OF SNOW FELL ON DECEMBER 5TH 1972...1.0 INCH OF SNOW WAS RECORDED ON DECEMBER 6TH 1998 AND MORE RECENTLY 1.3 INCHES OF SNOW WAS RECORDED ON DECEMBER 30TH 2003. THUS THE 3.6 INCHES OF SNOW THAT FELL YESTERDAY IS THE MOST SNOW TO EVER FALL ON A CALENDAR DAY IN DECEMBER IN LAS VEGAS. THE 3.6 INCHES OF SNOW THAT FELL AT LAS VEGAS YESTERDAY WAS THE MOST SNOW TO FALL IN LAS VEGAS FROM A SINGLE STORM SINCE 7.8 INCHES OF SNOW FROM JANUARY 30TH THROUGH FEBRUARY 2ND IN 1979. DECEMBER 2008 WILL NOW RANK AS THE 6TH SNOWIEST MONTH EVER IN LAS VEGAS SINCE 1937. THE SNOWIEST MONTH EVER WAS WAY BACK IN JANUARY 1949 WHEN 16.7 INCHES FELL. THE LAST TIME THIS MUCH SNOW FELL IN ANY MONTH IN LAS VEGAS WAS IN JANUARY 1979 WHEN 9.9 INCHES FELL. Figure 8. Special weather statement issued by the local Las Vegas weather office at 1245PM local time on 2008-12-18. Courtesy NWS Las Vegas. Finally, here are a few great pictures to commemorate the occasion. All are by local people courtesy of the Las Vegas Sun. Look at their photo gallery of the storm if you can - just beautiful.